If you are a returner or even a beginner we have something for everyone, so put your name down or just come along, watch and be inspired to take up this fantastic sport. 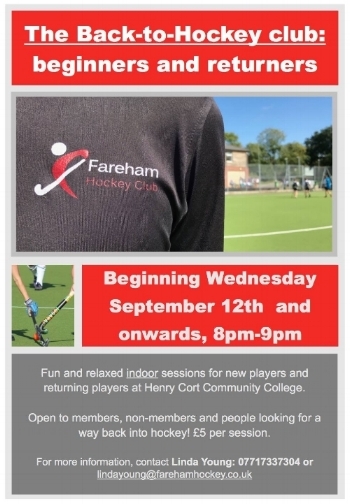 Fareham Hockey Club, together with City of Portsmouth Hockey Club, will be celebrating the life of Academy Coach Pete Atkins who sadly passed away on Boxing Day, 2017. Pete was a larger than life character who dedicated his life to the sport we all love. Pete’s experience spans from our current crop of U12’s, to coaching both Cookie and Lemmo as juniors. Yes, that’s who you have to blame lol ! Pete was widely regarded as the best junior coach in the South and probably across the country, and his achievement of coaching 4 Olympians over the period of 1988 – 2012 is a truly remarkable feat. So, how do we celebrate the life of this amazing man I hear you ask? Well, members of both clubs have held a few meetings and decided what better that a fun filled day of hockey spanning all ages. We have also set up the ‘Pete Atkins Youth Hockey Foundation’ to offer support to youngsters trying to make their way in the game and to offer coaching to the local community. We have contacted all of Pete’s Olympians and 3 have offered their services for the day. Sadly, Athens 2004 Goalkeeper, Jimi Lewis is away coaching the GK’s for the German National side. The first of 2 scratch games, where everyone and anyone can join in the fun. An exhibition game between a UK Lions team and a combined Fareham / City of Portsmouth Side will take place. To finish the day there will be a continuous roll up game for anyone who had the pleasure of knowing Pete, followed by raising a few glasses in his honour in the clubhouse. There will be an auction on the day of various Sporting Memorabilia with all profits going to the foundation. Participation – Let’s get as many Club Members there as possible. Cake Baking – for sale on the day, all profits to the foundation. Pete Atkins memorial T-shirts for sale. We are aiming to get as many people wearing a memorial t-shirt shirts on the day as possible! £10 each includes free hockey on the day for all who are wearing one!Profits are going to The Pete Atkins Trust for young sports people. Order by emailing chriswimshurst@outlook.com with your size (Sizing below) and colour choice. Collection on the day or if you can’t make the day, but don’t want to miss out on these one off shirts, then Chris can arrange to get them to you after the event. Please be aware, payment is needed on the day or contact Chris via email to arrange PayPal payment. ATKINS across back of shirt. Adult sizes: small - 37", medium - 40", large - 43", Extra large - 45", Extra extra large - 48". Kids sizes: 3/4 - 26", 5/6 - 28", 7/8 - 30", 9/11 - 32", 12/13 - 34"